The brown eight-points roof, reflecting the curve of buffalo horns is similar to the roof of the Pagarruyung Palace in Sumatera, while the off-white marble walls, a pastel shade of the brown roof, gives an impression of lightly varnished wood. Located within the Wisma Negeri Complex, its immediate is the Wisma Negeri building which houses the offices of the Chief Minister, State Secretary and other state and federal agencies and departments. With its exceptional shape and architecture, it is very much in contrast with other buildings around it, further enhancing its uniqueness. 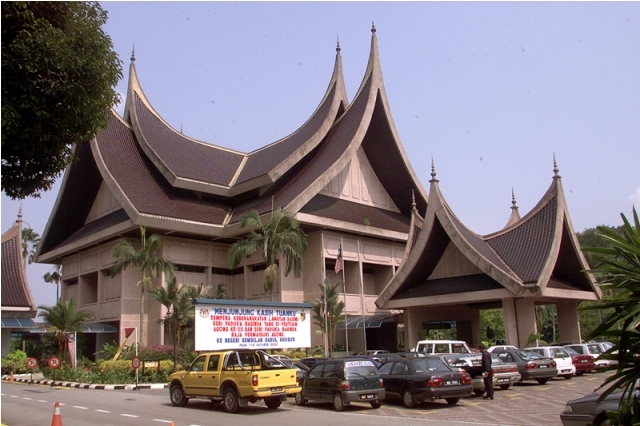 This building is the official venue for the weekly meeting of the Negeri Sembilan State Assembly EXCO members, as well as other official meetings and functions. For example, the opening ceremony of the State Legislative Assembly Sitting is an elaborately colourful affair. With the presence of the Yang di-Pertuan Besar, Tuanku Ampuan, Dato' Undang Yang Empat and Tunku Besar Tampin, the ceremony is a portrayal of nobility in all its grandeur. Located only 1.5 hours drive from Kuala Lumpur, our Show Farm is located on the 9th mile of the Port Dickson coastal road. Take a relaxing and informative time-out from the hustle and bustle of city life. Come see, smell, touch and learn all about these amazing creatures. Try seeding these 8 foot tall birds with your bare hands or, if you're brave enough, feel the excitement of ruling on their backs. 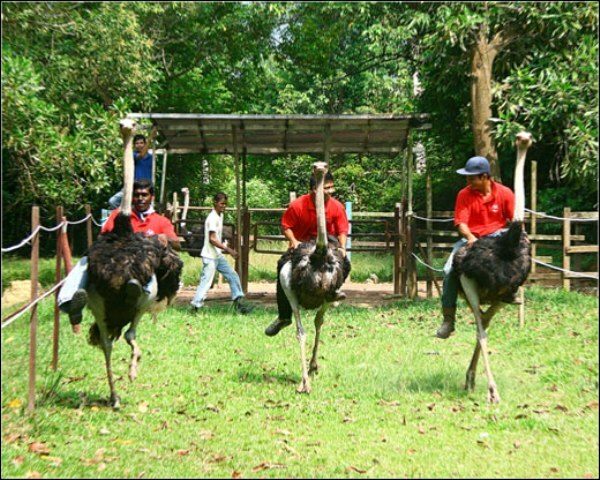 Embark on this fascinating adventure and be thrilled by more than ostrich of all ages at our show farm. Shopping for unusual items? You've found the right place. Our souvenir shop carries a range od rare and exotic products like Ostrich Leather wallets and handbags. Ostrich feather dusters, painted Ostrich, egg, shells and the highly sought after cosmetic products made from refined Ostrich Oil. For the gourmets, an on-site cafe serves a variety of healthy and delicious food items made from Ostrich meat like burgers, rotary and sweet dried meat. Finally to help you cool off all the excitement choose from a variety of refreshing soft drinks, ice-cream and other cold desserts. Come and visit us and immerse yourself in fun and awe. Spent quality time with friends and family, or just by yourself in a truly great and natural setting fit for children and adults alike.